Named for its stonewashed denim look and ease of care: machine washable and dry! Wait until you feel how soft it is! 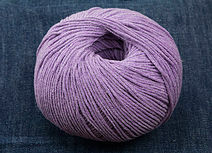 You are going to love this yarn just as much as your favorite pair of worn in jeans.